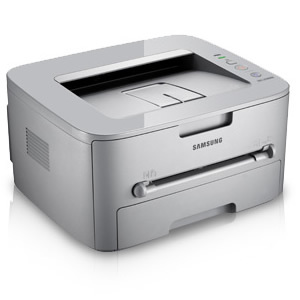 Samsung ML-1640 and ML-2240, a compact and cheep price and suitable for home and small office, has a starter Toner Cartridge can print maximum about 700 pages. It’s very easy to refill but it will make you mad sometimes when red light is on. So what’s happen? Samsung (maybe me if I made it 😆 ) don’t like customers refill tone cartridge so they placed a counter chip on mainboard. If you are an technican, it will be very easy (how to do, I will post up later). There many of articles about how to reset Samsung ML-1640, but I think almost of its are all fail because Samsung has changed Counter Chips and Firmware (from .83 to .93). After a long time I have resetted alot of Samsung ML-1640, I wanna give to all this tool. All free! This tool has two batch files have been named step1.bat and step2.bat to make all thing become easy. Everything you need have just do step by step as Readme.txt and wait for self reflashing routing active. How to check firmware version? – Turn on your printer (red light still on). – Press and hold down until data light on. – Your printer will printe out self test page. Read carefully to find out what’s your firmware version. Good luck! – Do it with your own risk. – Don’t turn off printer when reflashing. – If red light still is on, you can turn of your printer and start to reflash from begin. – If you can not make anything better, go to Samsung website and download reflash tool (ML1640_V1010083.exe) to reflash it back to very first firmware version. PS: Any more help pls comment here! I will reply all. i’ve got ml 1660, the toner’s empty, but i refill it already…… but it is say’s empty toner…. thank you very much! your advices are perfect! I had to rip off my toners chip and used your program, and it worked perfect! I have a Samsung ML-2240 the same problem; the light is red and it’s telling me to replace the toner. I refilled my samsung laser printer but now it shows toner low i checked the toner again but it is almost full with ink. So how can i reset my toner counter. Hi, I tried it and it worked. I would just like to say, that I have wait about 10 minutes and only yellow light for paper was blinking. Then I turn off and turn on my printer and there was no red light anymore. Thank you very much for this great solution! does it work with vista? I already had a page-counter (downloaded it 1 year ago), but works only on windows xp. Does this work on vista or windows 7? Just used this on our Samsung ML-1640, worked a treat. Thanks. thanks indeed for this useful link .. It’s working well … thanks samsung co.
is it working for os version 1.01.00 93 ? It’s seem to be not able to do that! You must to looking for version … 93 at samsung home site to reflash. You must to find 83_93 firmware, and run fix again. I need reset counter for SCX-4300. I have been updated as your commended. hai, i have tries it five times but not working, light flashing continuously abt printer not getting ready. any other options? You must to check twice your firmware version, if it’s 83-93, it will work. If it is not, you will fair to reset counter with this. i was able to successfully get the counter to 0 but again after i rebooted the printer it got it intial count and started giving message “toner exhausted”. any help will be appriciated. As upper reply, this tool only for 83, 93.
i also tried to downgrade the firware using the tool “usb____.exe” without success, the only effect of the tool is that the printer shows flashing light continuosly until i restart it..
SUPERB… THX MAN! YOU ARE No 1. Please take a look upper articles about reset ML-1640, we have discussed many more about it. Does anyone have a copy of ML1640_V1010083.exe? My ML-1640 printer was upgraded to firmware 96. How to I roll this back to 83 or 93? Nor can I find an 83 or 93 firmware file on the Internet. Samsung are no help. As I know, your Samsung printer can not downgrade firmware down to 83 or lower, but if you want, I will upload ML1640_V1010083.exe for you. I have tried to downgrade but failed, but why don’t you try more! Thanks……. It worked fine for me. But the Printer seems to be a bit slow now. Thanks a TON…worked great. I didn’t get the green light right after more than 5 minutes, but it came up after a power cycle. Thanks again. Worked!..did reset the count too!!!!….. :D…Thanks alot!!!!! I have A Ml-1640/xip, Mono Laser Printer who gone to change cartige. So, I want to refill old toner, I tried here your system & follow your guide but When i download your software that not include .exe soft. My printer soft ver. V1.01.00.93(LF). So, Now what can I do? Please Honestly help me. We have been updated for new version (v93), please come back soon (maybe tomorrow) for last update. Thank you! please suggest the s/w which can reset the counter. Great Working Good But How Many Priint Page……Please any budy tell me.. It worked on a ML-1640 with 91 firmware, thanks a lot. But you must turn off virus protection to first. Peaceful your mind, It’s been tested and scanned by Kaspersky Antivirus. Worked just fine. Thanks just fine. sorry guys, this is not working at all with my current firmware v.96. the reflashing is not taking place at all, the printer only blinks very very quickly in red/green mode, i’ve been waiting 15 minutes and it does not stop blinking. You must to download same with your version firmware. I have updated new firmware version as you want. Hope this help you. Please check again you have done all steps correctly. Check papers are ready in tray. It will be ok. We have done successful hundred times for this samsung product line. Works directly ! Counter is 0. I did the process, it worked fine. Thank you very much dude. However, after going through the process, only a yellow light was blinking until I lost my patience and powered the printer off. But the counter was reset. Thanks a lot. It was great. It worked exactly like you described for my ML-1640: Light get from red to organ and final green in less than five second. superb ! best solutions so far! Please send me also another printer solutions. and engine version is 1.10.50. Which firmware solution should i use? Your firmware version is v78. The basic method, first you find firmware that match to your current firmware. If not, you will must to upgrade to nearest firmware version (v83 is recommended). firmware of ml 2240 is upgraded 1.01.00.77 to 1.01.00.83 but still red led for toner status is on. At first when i check the printer it had the firmware of version 1.01.00.77, and the status was “toner exhausted” then i upgraded to firmware 93f i.e. i drawn the file FIX_ML2240_V1010093.fls to usbprns2 afterthat the printer restarted with orange light flashing then after some time power led is green but toner exhausted light”red” again flashing, So please help me on this matter. Your firmware version is v77. So as you know, you can upgrade to nearest firmware version. In this case, v83 is recommended. Please try again with v83. Hi for reset counter team. It`s great what you do! Please fix the “ML-1640 Firmware 60” download link. I wish you all goods! You can try to upgrade to v93 before to v96. – Hold Cancel Button for 5s, and turn on your printer. You will see light red-organ is blinking, your printer is in upgrade firmware mode. I don’t understand what you said. But as you said, your firmware version is v83, you can reflash with the same version or upgrade to higher. I have one ml-1640 v1.29.00.84 and i tried every firmware. When I turn on, the led blinks very quickly red/green/red/green…what i do? You must to download higher or match to your firmware version. I printed a test page. I never refilled a toner so, i have some questions..
i see alot of people selling resetchips for ML1640? where are these for? and then reset the counter wit above firmware? my local shops say i need to buy some chip and a chipholder before i can refill the starttoner? is that true? You can read guide post once again you will see which firmware is suitable for your printer. We are having nearest your firmware version is v93 (you must to get higher version if you can not get match your firmware version). You just do step by step as upper article you can reset your counter to zero but no need to buy any chips. You can believe me. We have done thousands of ML-1640 with this tool.